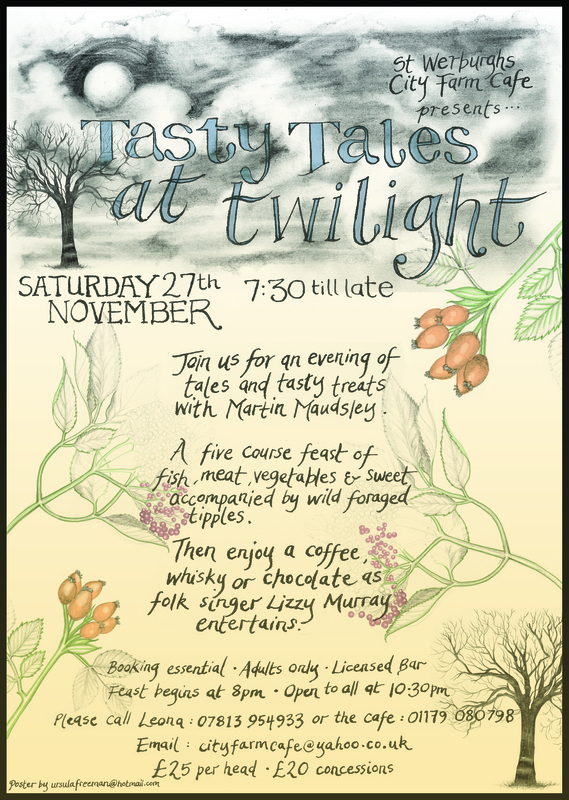 Tasty Tales offers a unique and sensuous evening of fine food and spellbinding stories to delight the senses, satisfy stomachs and tickle the imagination! For the last few years, storyteller Martin Maudsley has been collaborating with the award-winning St Werburghs City Farm Café to create an event that mingles and marinades food and stories together. Martin is also collaborating with Bridport Food Festival with a Tasty Tales event in June 2014, and will be part of a BBC celebration of local food in May 2014. You will be treated to a sumptuous supper comprising four courses of freshly prepared, locally sourced food intermingled with enchanting spoken-word stories, all skillfully served in an intimate, convivial atmosphere. Each event is subtly different and celebrates the food, flavours and folkore of the particular setting and season. The menu of stories gently complements the courses of food, playing with themes of seasonality, provenance and stewardship of the land, but always allowing the listeners to hear their own thoughts and make their own connections. Tables are arranged so that people can mix and mingle, and have opportunity to discuss the food and chew over the stories.